Last Week in Review: New and Existing Home Sales slipped in July. Forecast for the Week: Job growth and inflation take lead roles in an ensemble of economic players. View: Maximize your marketing response. “Time keeps on slippin’, slippin’, slippin’.” Steve Miller Band. While prospective homebuyers want to move through the process of getting into their dream home, that reality keeps slipping due, in part, to limited inventory. After a strong start to summer, New Home Sales took a dive in July. The Commerce Department reported July New Home Sales fell by 9.4 percent from June to an annualized rate of 571,000 units, below the 615,000 expected and a seven-month low. On a positive note, June was revised higher to 630,000 units from 610,000. Sales inventory for new homes rose to 5.8 months in July, up from 5.2 months in June; this is near the healthy rate of six months. Year over year, sales were down nearly 9 percent. Existing Home Sales in July slipped for the second straight month as large declines in the Northeast and Midwest outweighed sales increases in the South and West, according to the National Association of REALTORS® (NAR). Total Existing Home Sales slipped 1.3 percent in July to 5.44 million units from a downwardly-revised 5.51 million in June. 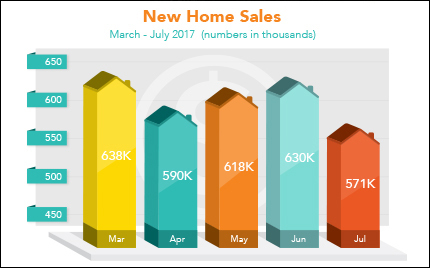 Although July’s sales pace is 2.1 percent above a year ago, it is the lowest of 2017. Total existing housing inventory at the end of July declined 1.0 percent to a 4.2-month supply and is now 9.0 percent lower than a year ago. While limited inventory may be a pain point in the homebuying process, the good news is home loan rates are still near record lows. Also of note, prominent central bankers, finance ministers, academics and financial market participants from around the world were at the annual Jackson Hole, Wyoming Symposium to discuss global economic issues. Fed Chair Janet Yellen spoke on Friday morning and didn’t make any big comments on monetary policy or the Fed’s balance sheet. If you or someone you know has questions about home loan products or current rates please contact me. I’d be happy to help. Job data and inflation are the stars of the week. The packed economic calendar begins on Tuesday with Consumer Confidence, followed by the Consumer Sentiment Index on Friday. Look for inflation news Thursday via Personal Consumption Expenditures, along with Personal Income and Personal Spending. Employment data is plentiful, starting with the ADP National Employment Report on Wednesday, weekly Initial Jobless Claims on Thursday, and Friday’s highly anticipated Jobs Report for August, which includes Non-Farm Payrolls, Hourly Earnings, Average Workweek and the Unemployment Rate. As you can see in the chart below, Mortgage Bond prices have traded in a pretty tight pattern recently, keeping home loan rates near historic lows. There’s nothing more disappointing than a dismal response to your marketing efforts. By applying these three proven tips, you can easily and dramatically increase the response you get from any marketing campaign. Pick the right audience. Giving critical thought to the response you want to generate or the client you want to attract is a crucial first step when it comes to marketing success. One size does not fit all in marketing, and more does not always mean better. Tailor your offer to a specific demographic you want to target, so your message resonates with the right people and you maximize your investment. Include just one CTA. Offer things like a demonstration, free consultation, or a download … but not all of them in the same marketing piece. Multiple actions confuse audiences and lower response rates. You’ve targeted your demographic; hone in on the action you want them to take. And remember: The only thing worse than including more than one call to action is forgetting the call to action altogether. Follow up consistently. Don’t give up on leads just because they didn’t invest in your product or services right away. Put cooled leads in your automated e-newsletter or holiday card blasts, or connect with them on social media. Also place an automated reminder in your database to give them a “just checking in” call or email a few times a year. If they are no longer in the market for your products and services, ask for a referral.